The Mona Lisa is a wonderful painting, but have you ever looked at it and thought it looked a bit… well… small? Mr Da Vinci might have something to say about that but if you like your art on somewhat of a bigger scale then the following pieces might be more up your street. Here are some of the biggest artworks in the world. In 2014, Artist Arno Coenen created what soon became known as the ‘Sistine Chapel of Rotterdam’ when he brought his work, entitled Horn of Plenty, to the Netherlands. 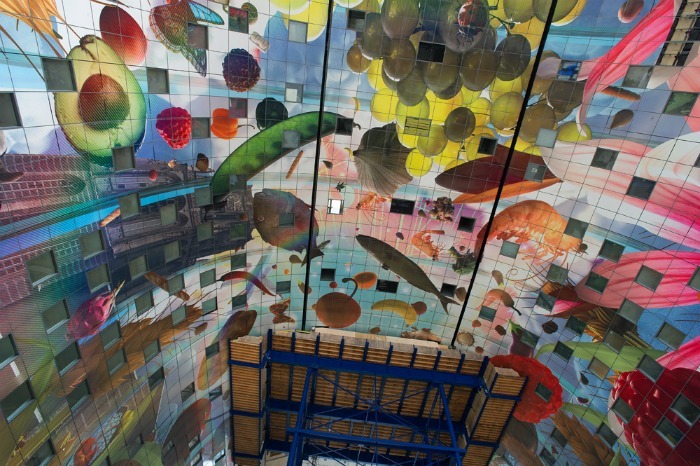 It covered 36,000 square feet of the De Markthal indoor market with amazing vibrant images of animals and plant life. 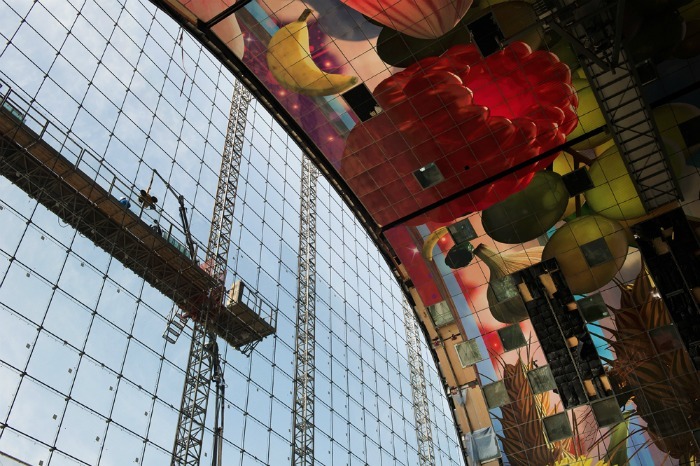 Coenen enlisted the help of none other than Pixar Studios to assist in creating an image large enough to be used, onto which moving images were also projected. According to some sources, the largest painting ever created was by Chinese artist Sun Lei entitled Beautiful Soul of China. It was made over a period of 8 years in Shandong, China, and apparently measures a huge 232,442 square feet. Sun Lei also allegedly holds the record for the longest painting, measuring 39,360 feet long. However, there doesn’t seem to be meaningful records of either of these paintings and images are very scarce, so it’s not actually 100% clear whether this is true, but we’ll give him the benefit of the doubt. Now, we can be sure that this one actually exists. The Big Picture, created by an Australian artist known just as Ando, is allegedly the world’s largest acrylic painting on canvas painted by a single artist. It measures 100 x 12 metres at its highest point and has been curved as part of an installation in which 300 tonnes of red dirt has been laid in front of the picture to blend the line between 3D and 2D. 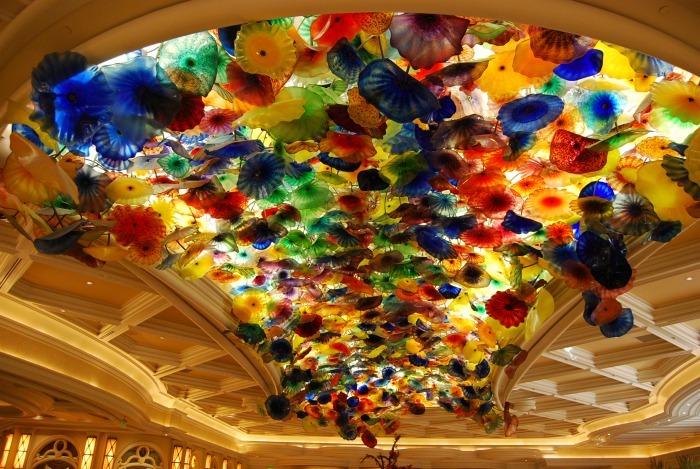 Hanging above the lobby of Las Vegas’ Bellagio casino is a spectacular glass sculpture by Dale Chihuly. It is comprised of 2,000 hand-blown glass blossoms of various shapes, sizes and colours and measures 2,000 square feet. This might be a little out of place on this list, but there’s no denying that this is a work of art. 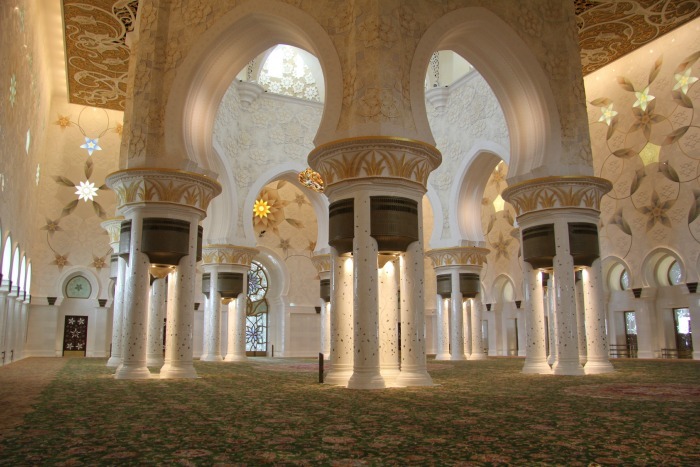 Laying in the Shikh Zayed Grand Mosque in Abu Dhabi, the carpet was designed by Iranian artist Ali Khaliqi and measures 60,570 square feet. It was made by around 1,300 carpet knotters, weighs 35 tonnes and contains a staggering 2,268,000,000 knots. The rest of the building is pretty impressive, too! 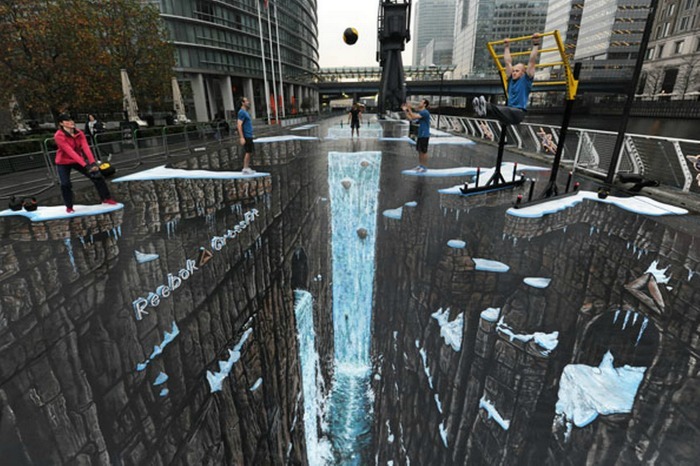 3D street art is a relatively modern invention but it’s really quite impressive when done right. In 2011, sports equipment manufacturer Reebok commissioned a piece of street art as part of Guinness World Records Day. Street artists 3D Joe & Max created the waterfall-themed piece which measured 1,160.4 metres square, although it no longer exists having been cleaned off the London street only a couple of days after being completed. In case the other pieces of art were still on the small side, how about something a little larger still? 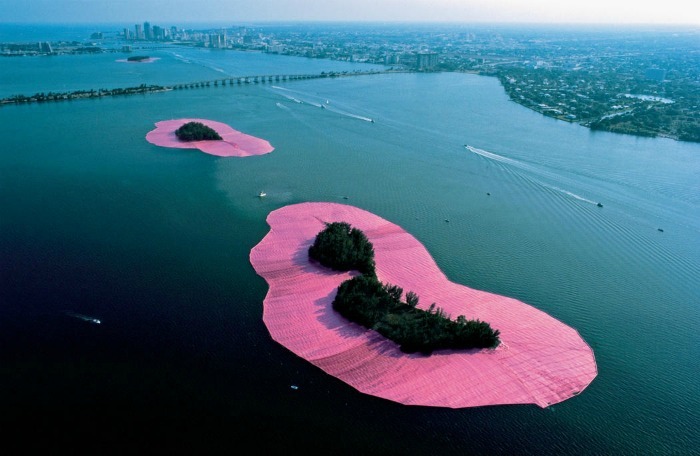 Surrounded Islands was created in 1983 by Christo and Jeanne-Claude and involved surrounding 11 Miami islands with 603,870 square metres of floating pink plastic. It’s our good friend Ando again, this time with something quite extraordinary. 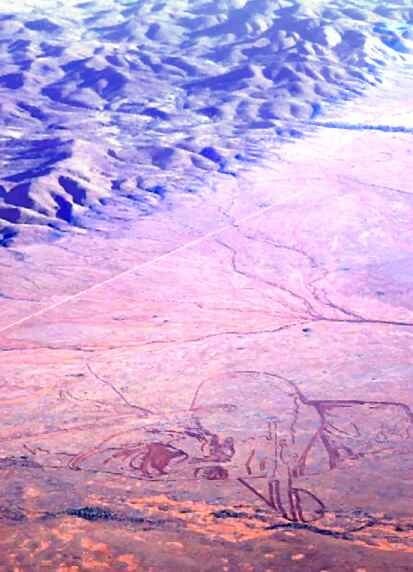 Covering an enormous 4 million square metres, his Mundi Man was ‘painted’ onto the New South Wales landscape, although it’s not clear exactly how he did it. For scale, the smile on the man alone is as wide as the Empire State Building is tall. Forget everything else. Tom Van Sant’s Reflections from Earth beats everything else primarily because it can (or could) be seen from space. 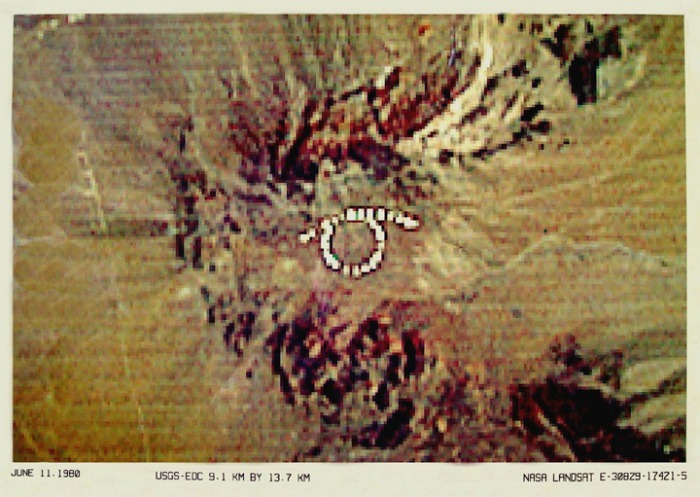 In 1981, Van Sant used mirrors to reflect sunlight up to an orbiting satellite which captured the image below. It was carried out in cooperation with NASA and was created using 90 mirrors 200 yards apart. Each mirror was only 24 inches square but causes the reflected light to appear several acres wide. The overall size of the eye shaped reflection is 1.5 miles across.